[0:22] <sqrrl> can i get on the monitor whatever i have in ssh? [0:24] <sqrrl> there is no way? [0:25] <sqrrl> i can play videos on the monitor but can't see text? [0:27] <sqrrl> i don't have a keyboard..
[0:39] * SpeedEvil wishes his internets would speeed up. [0:40] <davor> when wiring 3.3v to an input pin through a button, what resistance should I use, that is, what's the maximum current the input pin could take in? [0:42] <SpeedEvil> davor: This is in case the GPIO is accidentally set to output - so you don't have a large current flowing when the switch is closed. [0:43] <davor> ahh, awesome, thanks! [0:43] <davor> this question is most likely unneeded, but would 2k work too? [0:44] <rdz> what write speeds do people get for usb hard drives connected to the rpi? [0:47] <davor> what's the purpose of those speakers on a dial up anyway? [0:49] <nmpro> no.. not ISDN..
[0:50] <nmpro> it was a VERY long time ago. But I had two modems two phone lines and a special account.. geez my memory is bad..
[0:50] <SpeedEvil> It was made lots easier by the fact that back in the day BT internet would let you send packets from arbitrary sources. [0:51] <SpeedEvil> So I diddn't have to work out the iptables to make the packets go out the right hole. [0:52] <nmpro> SLI? I think that's what it was called..
[0:54] <Phosie> Ugh, police helicopter outside. So annoying. [0:57] <Phosie> I wouldn't mind as much if it wasn't midnight. [0:59] <Phosie> Just heard something that sounded like running, but only lasted a second. [1:22] <Hello71> are you sure? [1:34] <LordThumper> Hi, has anyone used RetroPie? [1:35] <mgorbach> Anyone able to help me out with a kernel panic? [1:35] <mgorbach> I'm getting one on boot, trying to set up Gentoo with the raspberry pi. [1:38] <lloowen> Hello all. New to raspberri pi Just configuring it to run using blackbox wm. There is no sound :( when I log into the default pi account and back into lxce there is sound, so I suspect there is something I need to include in a . file for in my home directory. Grateful for any help. [2:21] <Phosie> Never heard of it. [2:34] <davor> any easy way to find out what's what? [2:49] <CarlFK> http://pumpingstationone.org/2013/08/raspberry-pi-rob-bishop-aug-6th-ps1/ http://timvideos.us/psone live! [2:50] <Phosie> Google is amazing. [2:51] <l_r> does it work? [2:51] <l_r> can i play games? [2:53] <pksato> and, hookup to lirc, and control any lirc compatible application. [2:54] <davor> seems simple enough. thanks! [2:55] <pksato> yes, but, need to compatible to rc. [2:56] <pksato> rcX are protocols. [2:59] <pksato> TSOP17 is only a IR reciever. [3:06] <pksato> remove from old not is use equipament. [3:07] <pksato> its is standard. [3:09] <pksato> for XXI sec. [3:11] <pksato> ah... TSO17xx is for 5V, need two extra resistor to make a voltage divider. [3:12] <pksato> Oh, yes century (Seculo on portuguese and others). [3:19] <pksato> Rexodus: Yes, it is correct. [3:20] <pksato> wheezy is stable debian. Now, have only security update. [3:27] <pksato> can do. ttl out only. [3:29] <Phosie> davor: That would be hilarious. [3:30] <Phosie> I'd be scared of false readings. "I didn't do it, I swear!" [3:30] <davor> yep, I'm definitely bidding on it. [3:33] <Phosie> I have no ideas. [3:36] <davor> what's that expansion board called which supports 5v input and has analog pins for the Pi? [3:37] <davor> nice one Firehopper ! [3:39] <ripzay> you a corvette owner davor ? [3:39] <davor> car or boat? [3:40] <Phosie> first expansion board that came to my head. [3:40] <ripzay> meh, whatever, bed time! [3:41] <CarlFK> Firehopper: where is the code for that ? [4:14] <Phosie> but...would anyone wear that? [4:16] <Phosie> I remember Mythbusters Kari Byron did something similar. [4:17] <Phosie> She had a sensor but it kept going off on it's own, so they used a microphone instead. [4:24] <Phosie> I'd love that! [4:24] <Phosie> I'm a lazy cow. [4:28] <jda2000> Is there a special reason for raspberian to use ext4? [4:29] <pksato> only one, ext4 is main Linux fs. [6:14] <MannDude> Anyone know if he needs to do something specifically, or is the issue on my end? [6:18] <mike_t> .local is mDNS zone. http://en.wikipedia.org/wiki/Zero-configuration_networking . Windows isn't able to do it out of the box. [6:19] <Xark> MannDude: OK, then your buddy needs to (comes with iTunes and I believe is available separately from Apple). [6:57] <Xark> CeilingKitten: I completely agree. Not cool. [8:33] <McBofh> so ... do I take the kinda-MCE remote that i've got lying around, along with the IR-receiver-to-2.5mm TRS jack (ie, analog-ish) and hack it into something lirc can work with via the gpio pins, or do I wander over to my local pc parts distributor and fork over AUD45 for a Hauppauge MCE remote with usb receiver? [10:03] <pierrrrr> anybody with some openmax knowledge? [10:16] <quackgyver> I had a friend named Max. [10:16] <quackgyver> If that helps. [10:17] <linuxstb> pierrrrrr: What's your question? [10:21] <pierrrrrr> are there any code samples showing how to use video_render to display a still image? [10:22] <GTRsdk> Has anyone tried to compile Android on this? [10:22] <linuxstb> Not that I know of. Reading the docs at http://home.nouwen.name/RaspberryPi/documentation/ilcomponents/video_render.html it talks about "setting the port definition to an image domain" - have you done that? [10:26] <linuxstb> pierrrrrr: You shouldn't need to. I've played with the camera module in openmax, and just have a camera -> video_render pipeline, which works. [10:31] <fisher> hi anyone here develops / contributes packages for pidora? [11:28] <Encrypt> willybilly0101, On your Raspberry Pi? [11:33] <willybilly0101> any solutions for raspberrypi full disk encryption? [12:02] <wathek> no way !!! [12:09] <ShorTie> mineral oil in a deep freeze and go for 6ghz, lol. [12:11] <[Saint]> It'll top out around 4GHz. [12:21] <[Saint]> well, afaik its correct. [12:21] <[Saint]> it may well let you apply a higher value, but just cap it at the limit. [12:32] <gyeben> Could someone share the contents of /etc/ld.so.conf.d/ ? [15:28] <spobat> can i use the raspberry pi + a ssd card for a small git server? [15:29] <Phosie> I'm no expert but...most likely. [15:29] <hifi> what's an ssd card though? [15:29] <spobat> is doing that a good idea? [15:30] <hifi> yes, sd cards are flash memory, but what's an ssd card? [15:30] <hifi> is that some higher grade one? 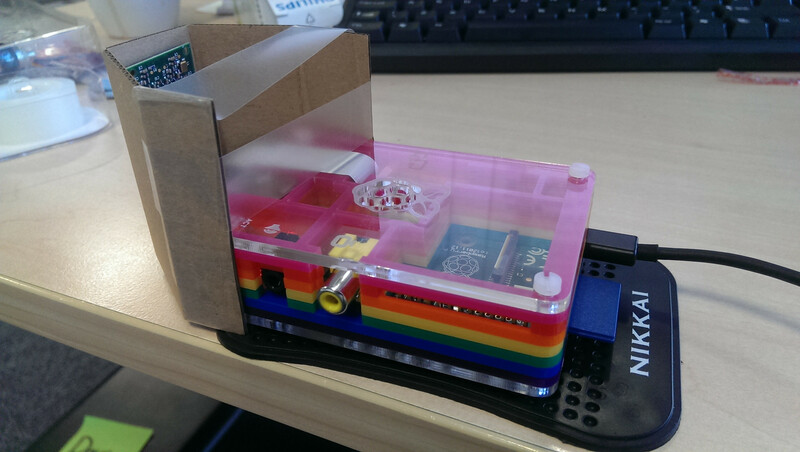 [15:37] <Haxxa> Hello, I'm using my raspberry pi to help a disabled person, what would be the best mp3 player that would work with buttons from the gpio? [15:38] <hifi> or vlc, they both support "remote control"
[15:43] <gordonDrogon> bob_binz, the avrdude on my website supports gpio. [15:44] <Phosie> Did you win that thing on Ebay? [15:45] <gordonDrogon> bob_binz, Hm. those alamode boards actually shipping? [15:45] <davor> I'm a cheapskate heh. [15:49] <gordonDrogon> bob_binz, I added in gpio support to avrdude for the gertboard. [15:49] <gordonDrogon> it programs the atmega on the gertboard using the gpio rather than serial. [15:50] <gordonDrogon> however - if you've built your own arduino from scratch then you can either use standard avrdude, or connect up the SPI port to it to program it directly. [15:52] <Haxxa> how would I interface buttons with mpd? [15:52] <gordonDrogon> Haxxa, does it have some hooks to allow 'buttons' to be interfaced into it? [15:53] <gordonDrogon> bob_binz, I've recently updated my avrdude too - it's now 100x faster at programming too..
[15:53] <gordonDrogon> bob_binz, how you program any atmega depends on how its connected to the host - serial or parallel. [15:54] <gordonDrogon> bob_binz, for serial, you need an avrdude with a compatible bootloader. for parallel (ICSP), you need an avrdude with a programmer device going to the chip, or directly via the Pi's GPIO. [15:54] <bob_binz> gordonDrogon, presumably the 328 on the gertboard has a bootloader that can be programmed serially? [15:55] <gordonDrogon> The 328 on the Gertboard has *no* bootloader. [15:55] <gordonDrogon> that's why we program it via the ICSP port - via those 4 jumper wires from the gpio port. [15:56] <bob_binz> gordonDrogon, so I have another 328 (not a P version) with a Duemilanove bootloader - can that be programmed serially? [15:56] <gordonDrogon> I'm surprised that someone has added in a new serial bootloader type for the alamode board. you can buy atmegas reay programmed with the standard serial bootloader. [15:57] <gordonDrogon> bob_binz, it can be programmed serially - if it already has the bootloader in it - the 2009's usually do have the bootlaoder. [15:57] <gordonDrogon> bob_binz, personally, I prefer to not use a bootloader, however it's easy if you're using a standard 2009/Uno via USB serial. [15:58] <gordonDrogon> bob_binz, the Pi acts as the ISP device via the GPIO. [15:59] <gordonDrogon> so if your paper pcb version runs at 3.3v then you can put it on-top of the gertboard and just move the jumper wires to it. [16:02] <gordonDrogon> put the 328p into the gertboard, and use the burn bootloader option. [16:02] <gordonDrogon> the nyou get a 328p with a standard serial bootloader. [16:02] <gordonDrogon> the nyou can use a serial interface to your paper-pcb version. [16:07] <gordonDrogon> it's not mine. [16:07] <gordonDrogon> I've been programming atmega 48 all week on mine. and a 328. and a 168. [16:08] <gordonDrogon> not tried an attiny85 yet - not reason it won't work either. [16:08] <gordonDrogon> as long as it's all running at 3.3v. [16:08] <Phosie> I don't even know where to start. [16:13] <gordonDrogon> I've been doing a lot of low-power atmega stuff this week too. I have an atmega down to under 1�A. [16:13] <gordonDrogon> so lasts for years on a good coin cell. [16:18] <Phosie> I thought that too. [16:19] <gordonDrogon> no - this is another board. going to be interesting when it's released I think. [16:20] <gordonDrogon> but a part of it has an atmega 48p on it with a little battery. [16:23] <gyeben> my build of Quake3 keeps freezing whenever I start a level - what can be the problem? [16:23] <Phosie> Are you running it from the gui? [16:25] <Phosie> did it straight from CLI and it worked a treat. [16:34] <ShiftPlusOne> gyeben, how much total memory do you have? is it a 256MB pi or 512MB? [16:35] <ShiftPlusOne> Well, you said 192, so definitely not 256MB, I guess... never mind. [16:43] <ShiftPlusOne> What did you have to change exactly? [16:46] <Phosie> Your CPU was nearly running at the speed of my netbook. [16:47] <gyeben> Phosie: what kind of netbook do you have? [18:09] <Matt> wouldn't you want HDMI to VGA? [18:14] <Wulong> Whats recommended R/W (class) for SD card? [18:21] <kephra> *aehm* what is the "r/w class"? [18:21] <kephra> any URL explaining it? [18:23] <PhotoJim> Wulong: if you don't care about I/O speed, it doesn't terribly matter. My SD card is just for local storage (any useful content is streamed from my server) so I have a Class 4 in one Pi and it's fine enough. The other is Class 10. There is a noticeable difference in how fast the second one can do a system update compared to the first, but otherwise I barely notice any difference. [18:24] <megaproxy> how does one turn off the camera board led? [18:24] <megaproxy> but what config.txt are they on about.. where is it? [18:31] <ShorTie> apt-get install mlocate ?? [18:33] <megaproxy> ok that didnt work..
[18:34] <kephra> davor, how many kg of noodles do you want to cook, how many people do you want to feed? [18:34] <SpeedEvil> Freezing works well for sauces. [18:35] <megaproxy> is this the correct method? [18:41] <johnc-> I just turned on my bouncer, should I ask why people are eating noodles for half a month? [18:41] <johnc-> or do I just assume student? [18:42] <davor> hey this is the first thing I have ever cooked! [18:49] <nmpro> lol.. davor, you guys crack me up. [19:14] <dagerik> how can i get audio on 3.5mm jack when i got hdmi tv connected? [19:17] <dagerik> really? cant i switch without rebooting? [19:17] <CeilingKitten> sudo nano config.txt | i dont know the line you add but i think its hdmi_drive 2 ? you want to set it for hdmi/dvi and then use the 3.5mm audio change to analog in the settings i think? [19:35] <linuxstb> dagerik: I don't know about alsa (or arch for that matter), but for openmax applications (e.g. omxplayer), you can specify the audio device as a command-line parameter. I would have expected the ALSA driver to allow you to switch though. [19:40] <linuxstb> You could probably just replace that with omxplayer, unless there are special features in mpg123. [19:40] <linuxstb> By default omxplayer outputs to the analogue audio, use "-o hdmi" for hdmi. [19:40] <linuxstb> omxplayer doesn't use ALSA. [20:07] <IT_Sean> Nice pibow case. 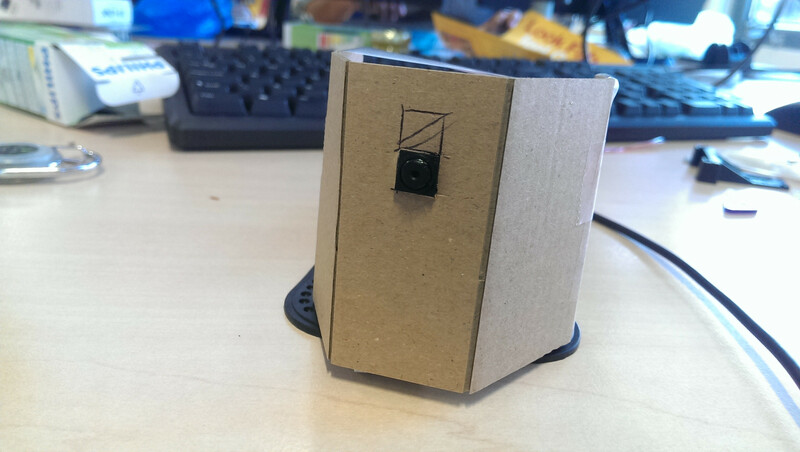 the cardboard lets it down a bit, though. [21:14] <nmpro> wish I could help you lufie, but I never use the analog audio.. have you checked the forums? [21:21] <pksato> lufie: updated firmware and kernel. [21:21] <pksato> or, lastes version of OS images. [21:21] <lufie> how can i check the version ? [21:22] <pksato> rpi-update or you OS method. [21:23] <pksato> but, some issues can't not be solved. [21:26] <pksato> humm, these two pwm channels used on audio, can be used to control speed of motor? (with some hw modifications). [22:13] <gordonDrogon> if you can dig-out the 2nd PWM line, then yes, can be used for speed control. [22:19] <ShorTie> did you add the user to the right groups ?? [22:23] <lloowen> ShorTie: Which groups would that be? [22:25] <pksato> lloowen: that command you used to create user? [22:33] <ShorTie> you still have to tell it what groups you want the user in, don't cha ?? [22:34] <pksato> Yes, and no. [22:35] <pksato> --add_extra_groups and EXTRA_GROUPS on /etc/adduser.conf need to use. [22:59] <SrRaven> theoretically, how many pictures can the pi and pi-cam deal with per second ? [22:59] <lloowen> My old media player(thin client) connected to the TV(HD) using VGA, now I'm using HDMI with the rp and all the films are shown in a small area in the middle of the screen. :| Is there a way to zoom in, or do I have to revert back to vga in order to view these films in full screen? [23:02] <lloowen> SpeedEvil: I guess that means you don't know? [23:03] <SpeedEvil> I vaguely remember it's something to do with the overscan setting - I've not been screwing with it though - it just works for me. [23:06] <pksato> lloowen: only movie is on small area? [23:06] <pksato> or, all screen/desktop area? [23:06] <PhotoJim> HD is a resolution, not an aspect ratio. [23:06] <CeilingKitten> lloowen, you playing the video in OMXPlayer? [23:06] <pksato> is is on full screen? [23:06] <PhotoJim> if you mean 16:9 then no, most amateur video is not 16:9. [23:07] <lloowen> CeilingKitte: I usually use mplayer from the command line to play movies. [23:08] <jedahan> if I am using a usb-ttl cable? [23:08] <pksato> mplayer? and can play smoother? [23:09] <pksato> I dont know if mplayer have support to openmax. [23:13] <PhotoJim> serial would be 115200 bps. [23:13] <PhotoJim> Ethernet is 100000000 bps. [23:14] <pksato> jedahan: use a serial to establish a ppp conection, now you can use xdmcp to get X11 session. [23:14] <PhotoJim> even old 10BaseT 10 Mbps Ethernet is a hundred times faster than the Pi's serial port. [23:15] <pksato> use, it is realy slow. [23:15] <pksato> Phosie: yes. no need gui. [23:16] <Phosie> It's been so long since I used it. [23:16] <davor> can I define two python functions and use the first one in the second one? [23:16] <pksato> davor: do not? [23:21] <pksato> or why not? [23:22] <davor> sorry, I misunderstood heh. thanks man! [23:28] <CeilingKitten> if its in your hand you meat as well put it in your mouth? [23:28] <ShorTie> i was goona comment, FFC kicked in, lol. [23:29] <CeilingKitten> lloowen, i think thats the one, there is a CLI gui form python, and a GTK GUi so you can run it windows from the desktop. [23:29] <CeilingKitten> =) hi phosie whatcha pondering? [23:30] <Phosie> How to get to a CLI, the closest i can get is the lxdm (or lxde) login screen. [23:33] <davor> Phosie, wait, Arch came with lxde? [23:36] <Phosie> All is well. [23:48] <CeilingKitten> alias play="xterm -fullscreen -fg black -bg black -e omxplayer -o hdmi -r"
[23:49] <pksato> SrRaven: you can stream a HD video too. h264 encoded. [23:50] <SrRaven> and WiFi can handle that? [23:50] <linuxstb> Depends, on various things. But you can set the bitrate of the encoded video to something your wifi environment can handle. [23:52] <pksato> try to watch a 1080p@30fps over a wifi. or youtube video. [23:53] <nmpro> has anyone used the Patriot Memory Wireless 11n usb adapter on their rpi? [23:56] <nmpro> I'm asking only because I wanted to know if its working without the use of a powered USB hub? [23:56] <ShorTie> wifi stick, are those like chop sticks ?? [23:57] <pksato> nmpro: all wifi need a powered hub. [23:58] <nmpro> pksato, that's not always true..
[23:58] <nmpro> that's my problem then..
[23:59] <SrRaven> so, anyone got an advice for a budget usb stick ?